Born and raised in Vero Beach, Chris built Mazzarella's Automotive at the young age of twenty. He has been blessed by establishing the largest independent automotive facility in Vero Beach and has been in business over 11 years. Mazzarella's is family owned and operated. Chris and Kerri have four young children, who from time to time will be seen around the shop. We are proud to be members of the Christian Business Association. Customer service and satisfaction are extremely important to us. We want your experience here to be the best it can be. With a state of the art facility and twelve bay shops, we guarantee that your car will be diagnosed and fixed in a timely fashion. You can rest assured that your vehicle will receive outstanding service at a fair and equitable price. We are proud to provide a clean, comfortable, and child-friendly waiting area. For your convenience Mazzarella's Automotive is happy to provide a courtesy shuttle service. We give great thanks to all of our customers for entrusting us to serve their automotive needs. We hope to see you soon and God bless! Originally from New York, Kristal has been with the company since 2005. She received her Bachelor's degree at IRSC. She is happily married to her husband Ben and they are parents to two little boys.Kristal enjoys being near the water during her free time. Mark has over 30 years of service writing experience, 10 of those years are with us here at Mazzarella's Automotive. He is an avid antique collector who has a huge passion for antique cars. Craig has over 11 years of service writing experience. He enjoys spending time on the water, fishing with his family. 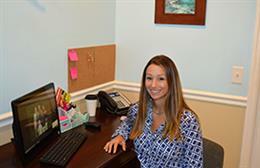 Born and raised in Florida, Ashlee obtained her Bacherlor's Degree from UCF. She enjoys spending time with her family. David has been with Mazzarella's Automotive since 2001. He is ASE Master certified. David is a father of two, who enjoys antiquing. Dean is a family man with roots in the community both personally and professionally. He has been a mechanic ever since he could hold a wrench. Dean possess excellent mechanical aptitude and has an analytical mind to help diagnose issues with an assortment of vehicles. Originally from Massachusetts, JD relocated here to Vero Beach in 1988. He has over 16 years of experience with automotive work. For leisure, JD enjoys hunting. Born and raised in Florida, Chris has many years of mechanic experience, 3 of those years with us here at Mazzarella's Automotive. During his free time, Chris enjoys being near the ocean. Sammy is a long time Florida resident recently relocating from Miami to Vero Beach.He has over 30 years of experience working in the automotive industry. A father of 3 who enjoys spending time with his family most.